Every notice can have up to 250 words and a photograph. Your notice will appear in the Notices section of Rochdale Online . The notice will never be removed from the site since we archive everything published. Because your notice is online, it can be sent easily to friends and family members anywhere in the world. Photograph: include a full colour photograph of your loved one. Email: enabling the notice to be forwarded on to family and friends. Print: to enable the notice to be printed, together with the colour photograph to frame or keep. Family and friends can access the notice 24 hours a day, 7 days a week, 365 days a year. Notice remains on Rochdale Online for access at any time and can be found by the major search engines. Rochdale Online currently has over 150,000 unique visitors and this is increasing year on year. Please email the text for your notice to notices@rochdaleonline.co.uk today. You can either email us the photo as an attachment, post it to us or we can scan it (while you wait) at our office. Call into our office at, Rochdale Online , First Floor, 122 Yorkshire Street, Rochdale, OL16 1LA. Any photos posted to us will be returned to you by post within 7 days. For more information, ring 01706 523583 during office hours. £30: Notice displayed with one photo. Payment is required when booking your advert. 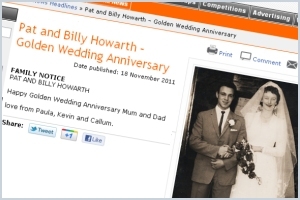 "We have been using Rochdale Online for our Obituary Notices for a while now, the system is easy to use, with no deadlines to adhere to and our notices are published the same day. Our families like the fact that a picture can be used, they have freedom with the amount of words allowed and it is very cost effective."